Since the industry defining arrival of Call of Duty 4: Modern Warfare, it seems that every action/adventure themed game tries to mimic it in some way or another. Whether it's the frantic, twitch-shooter gameplay or the over-the-top on-rails set pieces, you can see some of those Call of Duty trademarks sprinkled throughout a plethora of modern day releases. As much as I love a good adrenaline pumping action experience, I'm equally (if not more) attracted to the slower-paced gameplay often synonymous with stealth games. A prime example of this type of game would be 2012's sleeper hit Dishonored, which you can tell was influential to the Thief reboot. There is just something gratifying about slipping into the shadows, figuring out the patterns of your foe, and making your way through a fortified location, all with the hope of remaining undetected. When firing up Thief, I was immediately enticed by the “Moral Victory” gold trophy (Complete the game without a single kill or knockout), and figured that would be the best way to experience Thief. It’s also the way I believe Eidos Montreal intended gamers to play this title. Playing stealthily isn’t as rewarding if your nemesis is not equally as challenging, so I decided to play the game on Master difficulty. This would require me to move slowly and quietly, think about my approach by scouting my environments better, and making sure to avoid those out looking for me. Basically, I’m playing this the opposite way that I would approach just about every other action game out there today. Thief has you stepping into the shoes of Garrett, a master thief who channels his inner Robin Hood and only steals from the rich and privileged. The prologue to Thief introduces you to “The City," a Victorian inspired world that is nicely detailed with plenty of homes for you to explore and, more importantly, steal from. During the prologue, which doubles as a tutorial, you meet Erin, who is your protégé of sorts, but is far more aggressive and lethal than Garret. You both have been sent on a mission by Basso to retrieve a particular item, and while you're running across rooftops lecturing Erin about how she is too reckless and impulsive, she questions your ability to do whatever is necessary to get the job done. Not long after that, the two of you stumble upon a ritual involving the Primal Stone, which just so happens to be the object that Basso sent the two of you after. Eventually, the ritual gets out of hand and triggers a supernatural event. Erin’s stubbornness puts her in harms way, forcing Garret to save her before losing consciousness himself. From there Garret awakens, not knowing what happened to him or Erin on that rooftop, and he is tasked with performing jobs that will ultimately lead him to the answers he seeks. The book used by those in the ritual becomes a hot commodity through the first four chapters of the game, and its powers appear to be the driving force behind the story. After five hours of gameplay, I’m only through four chapters of the game. I have played the game as I set out to. I’m scouring homes throughout The City in an effort to make more money so that I can upgrade my abilities, or use this money to purchase tools that give myself more options as far as paths to take. There are also items such as various arrow types, which prove useful when you need to extinguish fires (creating more shadows) or lower ladders that are otherwise out of reach. I would recommend picking up the drill and knife early on, as you’ll be able to access locked vents and remove paintings, respectively. 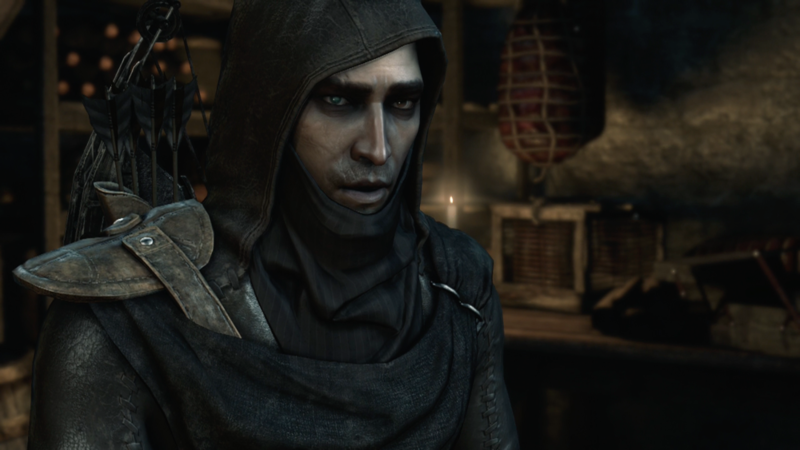 Like many of the games that inspired it, maintaining stealth is encouraged in Thief as well. Utilizing the shadows to conceal yourself from roaming guards is the most common tactic, but it is unfortunate that, even on Master difficulty, sometimes there are moments when even I was like, “Come on! How did they not see me right there?" This diminishes the tension knowing that the AI just isn’t as challenging as I’d like it to be. If the shadows were as dark as say Splinter Cell: Blacklist, then it would’ve made it more believable. Garret has a variety of other methods at his disposal which he can use to gain an advantage over his enemies, such as extinguishing fire-based lighting (torches, fireplaces, etc) using his water arrows. It’s nice to know that the AI is at least smart enough to investigate suspicious activity, and even relight the fire after awhile, but not before you’ve made your way through the area unnoticed. Locating ladders and grates, which are used to climb to reach higher vantage points, also allows you to not only flank the enemy, but obtain a bird's eye view of the area, as well as hidden passages and collectibles via your Focus ability (more on that in a minute). You can also direct the attention of guards to a particular area by destroying vases and the like, or you can even talk into your headset (you must enable this in the options menu) to attract their attention to your current location in order to pull them away from your true destination. All in all, there are many methods you can use to remain stealthy throughout. The other main ability Garrett has is called Focus. When enabled, Garrett is able to see items that may be useful to you depending on your style of play. You’ll be able to spot those ladders I mentioned earlier, in addition to grates which you can latch onto in order to climb to higher locations (the rooftops are a thief’s friend! ), and collectibles. You can rank up this ability by either purchasing Focus Points from the Queen of Beggars, or by finding Focus Points hidden throughout the story. Focus Points can be used to enhance your Focus ability according to your play style and, whether it be stealthy or lethal, there is something for everyone. I do have some issues with Thief (other than the aforementioned lacking AI), but they haven’t impacted my enjoyment of the game yet, and I'm hopeful they don’t become more pronounced the further I go into the game. The cut scenes are a mixed bag, as some of them look quite good, while there are others mixed in that look like they were ripped from a last-gen version of the game. It's quite noticeable. There are also a few audio dropouts during these cut scenes, possibly even causing you to miss certain plot points at times. There were also audio dropouts during gameplay, including one instance where if I moved to a certain area in the map, the sound would cut out completely, and once I moved a few steps in any direction after that, all the sound would pick back up again. The controls are serviceable, but you can’t help but wonder if some actions could’ve been better implemented. Using L2 to run (as opposed to clicking down L3) is an adjustment, but also needing to use it to climb ladders and jump to those grates to reach high ground just seems a little odd. The touchpad is used to change which item you want to use, but even then there were some issues with accuracy as far as pulling up what I needed. I’m sure with some practice, the control issues will be an afterthought; it’s just a shame you don’t have the option to change the control scheme to your preference. Early on, I have to say Thief has my full attention, as its subdued gameplay and focus on stealth is right up my alley. The City is a cramped, but detailed, world that is brought to life by its amusing citizens, ambient music, and overall design. With deliberately paced gameplay, it will be dependent upon level variety and story to keep me similarly engaged for the remainder of the campaign. The game excels at making you think like a thief, which I’ll admit is a guilty pleasure of mine, and I’m sure that’s exactly what Eidos Montreal set out to do when they made Thief. Stay tuned for our official review, coming soon!